On Wednesday 22nd of February, we had the pleasure of to host Professor Eberhard Widman as one of our weekly invited speakers for AMOPP seminars. His research in the ASACUSA (Atomic Spectroscopy And Collisions Using Slow Antiprotons) collaboration is heavily related to the kind of antimatter experiments that we do at UCL, except they deal with anti-hydrogen atoms which they produce using positrons and anti-protons from the Antiproton Decelerator (AD) at CERN. 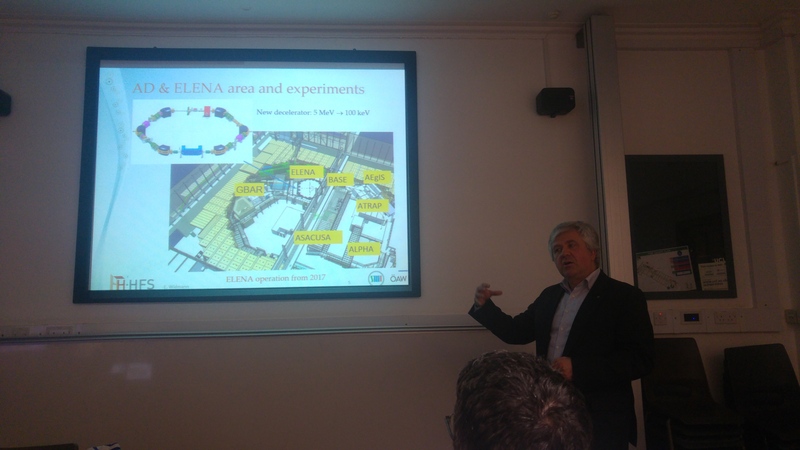 The main focus of his talk was the prospect of making measurements of the hyperfine structure of anti-hydrogen. He kindly agreed to provide a copy of his slides, which you can download here. The ground-state hyperfine structure (GS-HFS) of hydrogen is known from the hydrogen maser to relative precision of 10–12. It is of great interest to measure the same quantity for its antimatter counterpart, antihydrogen, to test the fundamental CPT symmetry, which states that all particles and antiparticles have exactly equal or exactly opposite properties. Since CPT is strictly conserved in the Standard Model of particle physics, a violation, if found, would point directly to theories behind this framework. The application of the maser technique requires the confinement of the atoms in a matter box for 1000 seconds and is currently not applicable to antihydrogen. Therefore, the ASACUSA collaboration at the Antiproton Decelerator of CERN has built a Rabi-type beam spectroscopy setup for a measurement of GS-HFS. With the initial aim of characterizing the setup devised to measure the GS-HFS and to evaluate its potential, a beam of cold, polarized, monoatomic hydrogen was built and used together with the microwave cavity and sextupole magnet designed for the antihydrogen experiment. The (F,M)=(1,0) to (0,0) transition was measured to a precision of several ppb , more than a factor 10 better than in the previous measurement using a hydrogen beam. This result shows that the apparatus developed is capable of making a precise measurement of the GS-HFS of antihydrogen provided a beam of similar characteristics (velocity, polarization, quantum state) becomes available. In a recent publication on the non-minimal Standard Model Extension (SME), describing possible violations of Lorentz and CPT invariance, Kostelecky and Vargas  conclude that the in-beam hyperfine measurements of hydrogen alone can be used to constrain certain coefficients of their model, which have never been measured before. The status and prospects of in-beam measurements of hydrogen and antihydrogen will be presented. V.A. Kostelecky and A.J. Vargas, Physical Review D 92, 056002 (2015).